Today the sun was shining, so I went to Hampshire to see some of the gardens that are famous for their rhododendrons and azaleas. 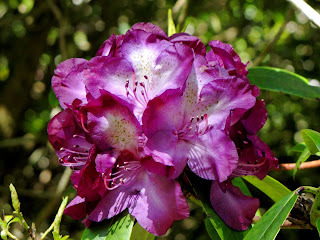 First stop was Exbury, which I had never seen and although the rhododendrons were quite spectacular - almost edible in fact - I have to confess that I felt little sympathy with the gardens. There is no doubt that the floral displays are astounding, but the whole ethos of Exbury is geared towards the older person, and I felt as though I was walking around the grounds of a rather exclusive nursing home, rather than a garden! This is perhaps compensated for by the wonderful colour palette of the endless rhododendrons and azaleas throughout the grounds. And I would imagine that autumn is another show stopper given the large number of acers at Exbury. A word of warning though on visiting this garden - because of its location, you need to time your visit quite carefully. The traffic can be quite dreadful because access is through the New Forest with its numerous cattle grids and varied four-legged populations that have a habit of strolling out into the road into the path of oncoming vehicles. My next stop was Spinners, an enchanting woodland garden at Boldre. The colours here were just as good as Exbury and there are wonderful displays of rhododendrons, azaleas and many interesting ground cover plants. It also has an excellent nursery with a large selection of shade-loving plants, which are normally hard to find. Well worth a visit, but also worth bearing in mind that much of the garden is on a slope, so not brilliant for wheelchair users. The third garden I visited today was my favourite and I spent a long time here savouring the lovely colours and clever planting - this was Furzey, near the village of Minstead. If you are a member of the RHS you will save yourself the entry fee. Like the other two, there are stunning displays of rhododendrons and azaleas, but also banks of brightly coloured flowers at every turn and some fascinating thatched buildings that make this garden memorable. It is easy to visit these three gardens in a day since they are all close together. 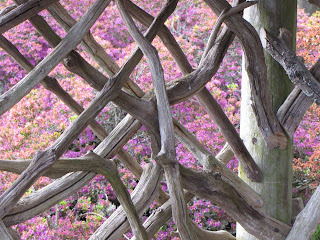 Exbury is a Historic House property, Furzey is covered by RHS membership, as is Spinners.